Rejse fra Arequipa til Yanque gennem Colca Canyon, oplever lokale Andesbyer og imponerende dyreliv under denne 2-dages, 1-nat-tur. Rejs gennem det fantastiske landskab i det sydlige Peru, der passerer alpine søer, gletschere, vulkaner, før du når den utrolige Colca Canyon, hvor du vil observere Andes-Condor i dets oprindelige levested. Undervejs vil du også stoppe med at få en smag for det daglige liv i de små landsbyer i Andesøerne og få mulighed for at se en imponerende vifte af dyreliv som alpacas, Andes-ørne, flamingoer og ibises. 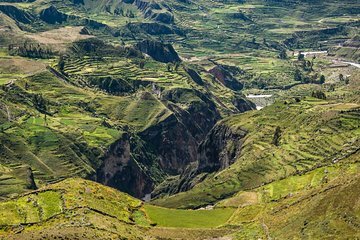 Denne tur gennem Colca Canyon til Yanque indeholder også en guide, en overnatningsophold, alle indgangsgebyrer, morgenmad og rundrejsetransport. We had a really good tour, our guide, Juan, was very helpful and knowledgeable about all the areas we discovered during our 2 days. We left from Arequipa and stopped along the way to Chivay several times for photo ops of alpacas and algunas. The next morning, very early, we left for the Canyon and condor sighting viewpoint. We were there an hour and in the first 15 minutes or so we saw 5 or 6 huge condors come flying by! After that though, nothing. We did drive to a few other viewing points but still no more. Good trip overall. Tiring all the bus riding. Also on the way we stopped at one 16,000 ft altitude viewpoint! Cold! Disappointing.the guide picked us up from the hotel, then drove us to the city of th Colca Canyon where we had the hotel just after lunch. he stopped several times on the way and introduced us to the landscape and the history. But he left us at the hotel at 3, with nothing to do in a deserted town. Gorgeous sights, really knowledgeable tour guide, friendly crowd! The guide took the time to get to know us and our interests, and he chatted with me several times about my interest in geology and some of the features/sights we were seeing. He was great about sharing details about history, culture, and geography. Also, my brother with whom I was traveling had been feeling increasingly unwell, and our guide went out of his way to check on him and call over a nurse at one of our rest stops. He helped me pick up the various foods/drinks she prescribed him as a quick fix, and checked in regularly to see how he was doing. My only piece of feedback would be for the description on Viator: I wish it'd been more explicit that there wouldn't be any hiking involved. Granted, being at altitude would have made it difficult regardless, but a little more explanation would've been nice. This tour could have gone 2 ways, really boring or really informative. Thankfully we got the later. Carlos Lazo was our guide and he was absolutely amazing! He shared so much history and information about the area. He was also very funny and made sure we had everything we needed.